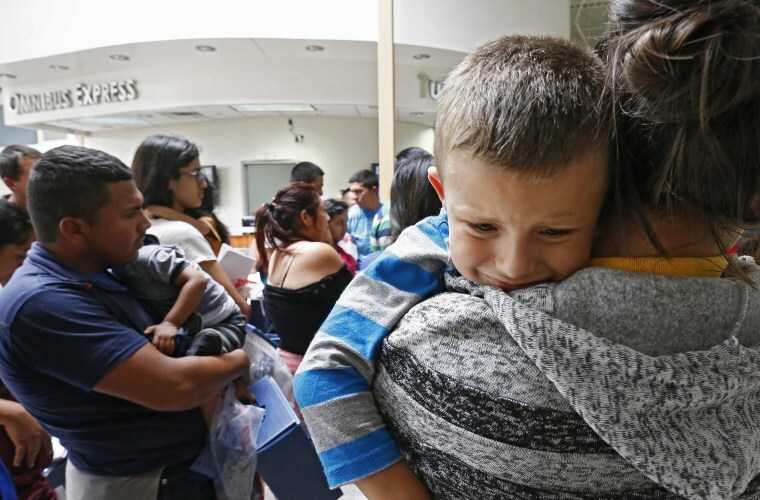 WASHINGTON — Lawyers for the Justice Department told a federal judge on Tuesday that the U.S government expects to reunite roughly 1,600 parents deemed "eligible" with their children by the court-ordered Thursday deadline. But the whereabouts of many other parents of migrant children remains unknown. "This is a remarkable achievement," U.S. District Judge Dana Sabraw of the Southern District of California, who is overseeing the class action lawsuit filed on behalf of the separated parents. But Sabraw told Justice Department lawyers that it is "deeply troubling" that they have not provided more information on the parents whose status is unknown. He blamed the poor planning of the "zero tolerance" policy that separated parents caught crossing the border illegally from their children. Justice Department attorney Sarah Fabian said 1,012 parents have been reunited with their children so far, but it remains unclear how many have been deported, released into the United States or remain detained. "There has to be an accounting," Sabraw said to lawyers during a status conference on Monday. "It's the reality of a policy that was in place that resulted in large numbers of families being separated without forethought as to reunification and keeping track of people," the judge continued. "And that’s the fallout we’re seeing... It appears there’s a large number of parents who are unaccounted for or who may have been removed without their child." Sabraw said he expects the ACLU, which is representing the parents in the case, to challenge some of the reasons the Justice Department has found parents "ineligible." One of the categories expected to be most hotly contested are parents who were deported without their children. In a filing on Monday, the Justice Department said 463 parents may have been deported and are therefore not considered part of the class they’ve been ordered to reunify by Thursday. At least 85 of those parents signed waivers upon deportation, indicating that they would rather be deported without their child so that the child could seek asylum in the United States. But ACLU lawyer Lee Gelernt said his organization has been collecting affidavits that show parents have been taken in groups of 50 and forced to make the decision in as little as three minutes — often without knowing their legal rights. "Things down there are a mess," said Gelernt. Fabian, the DOJ attorney, said of the 1,637 parents who have been reunited or will soon be reunited with their children, 900 of them have final orders of deportation. The ACLU has asked that reunited parents be held with their children for at least 7 days to give ample time to immigration attorneys to find them and provide legal consultation. Gelernt said the ACLU expects one facility — Karnes County Residential Center in South Texas — to receive 700 yet-to-be reunited families before Thursday. “There’s no way in a couple of days to provide meaningful consultation," he said. Earlier Tuesday, the government said holding families for that length of time would strain government resources and argued that Sabraw did not have the jurisdiction to limit their power to expeditiously deport.